Your browser does not support HTML5 video. But here’s a version on YouTube for you. The 2020 Program will begin in February! Stay tuned & sign up for our newsletter for more info! This is a full-spectrum, alignment-based Vinyasa teacher training designed to give you a full skill-set for teaching yoga. Teaching yoga is a path of self-discovery, shared inspiration, and service. We want to share this path with you. The Yoga Union teacher training program has been running for twelve years. Our aim is to help motivated yoga students become extraordinary yoga teachers. Nearly all of Yoga Union’s instructors are graduates of our program. Many other graduates have gone on to teach at other studios and even run programs of their own. Our experienced directors take each student’s individuality into account. They will encourage you to step outside your comfort zone and learn about yourself: your desires, your skills, and your perspective. Knowing that you have something special to offer, they will empower you to teach as your most authentic self, to see your students as individuals in turn, and to work with their injuries, ailments, and unique bodies. Our graduates understand that a yoga teacher does not have all the answers, but rather continually learns to perceive and grow to meet each student’s needs. This training will give you plenty of practice at teaching, to make the experience comfortable and joyful. Our approach is community-oriented. We emphasize the importance of healthy relationships. Your teachers and your peers will support you just as you will support them. The Breathe Building is a terrific site for learning and for leisure between sessions. The space offers a café, rooftop studio, sauna, wellness center, childcare, and more. Minimum one year of consistent yoga practice (three days per week). View course curriculum. 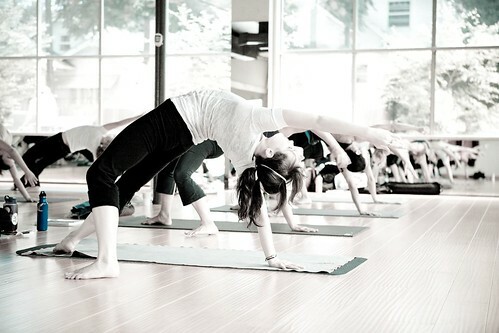 Annie Adamson is co-owner of Yoga Union Community Wellness Center and founder of Primal Vinyasa™. She brings over a decade of experience practicing and teaching Yoga, Workshops, and Trainings. Annie’s deep love of mythology, natural movement, and the study of Earth Medicine traditions inspire her work. She is certified in Anusara, Power Vinyasa and Hatha Yoga. Chris began his yoga practice at Yoga Union and has been a part community for nearly a decade. He is the owner of The Breathe Building and over the last seven years has accumulated thousands of hours studying yoga with a diverse set of teachers including Christina Sell, Todd Jackson, Sianna Sherman, Jason Crandell, Rolf Gates, Noah Maze, Doug Keller, Jeanmarie Paolillo, and Yoga Union’s own Annie Adamson. Chris enjoys teaching alignment and flow and his studies explore Anusara, Iyengar, Vinyasa and Inner Body Yoga. When you take class from Chris you’ll get detailed and clear alignment, a strong physical challenge, and creative, intelligent sequencing. Chris’ Vinyasa classes combine music and yoga together in a vibrant conversation of movement and feeling. He founded Surrender to the Flow Phish Yoga in 2010 and since has help raise over $11,000 for Street Yoga, Living Yoga and The Mockingbird Foundation. He teaches music themed classes set to artists like Phish, Pink Floyd, Bob Marley, Michael Jackson and Madonna. Chris teaches workshops and contributes to teacher training programs and Chris holds an MA in Counseling Psychology. He worked as a Child and Family Therapist prior to teaching yoga and is a board member at Living Yoga. Winter has been part of Yoga Union from its inception and her vibrant presence has been integral to the development of the community. Winter is grateful to both Annie and Todd for the opportunity to be a part of Yoga Union and for their unending support in her growth. In addition to her dedicated yoga practice, Winter has extensive training in various movement arts, anatomy, and Traditional Thai massage. She holds a degree in Kinesiology & Exercise Science and brings over a decade of experience as a personal trainer, aerobics instructor, yoga teacher, and massage therapist. Winter’s touch is healing and purposeful, and she sees her yoga and massage practices as deeply intertwined. Her classes are playful, but challenging and structured to align breath, mind, and body. Her sincere wish is to enable others to find their personal power and progress on their own path to liberation. Off the mat, you’ll find her adventuring with her friends, supporting her rockstar husband, and being a mom to her two beautiful daughters. Todd is co-owner of Yoga Union Community Wellness Center. He is a certified AnusaraInspired teacher who also holds certifications in Vinyasa Yoga and expertise in Restorative yoga. Todd’s yoga practice was born from his quest for relief from chronic low back pain. Shortly after, he moved to Portland to drum in a rock band and was immediately delivered to the Yoga Union. Among the community he met his first real yoga teacher, Annie Adamson. Years later the two lovers were offered ownership of the very place where they met, Yoga Union, and together they took a leap of faith, becoming Yoga Union studio owners. Todd is forever grateful for his mentorship with Sianna Sherman, whom he studied extensively with including immersions, teacher trainings 1, 2, and 3, and countless classes, workshops, and therapeutics sessions. Todd largely attributes his poetic styling and playful use of heart-language to Sianna’s artistic guidance. As a yoga teacher and leader, Todd’s ambitions stem from his love for nature and movement, as well as his commitment to facilitating connection in community. 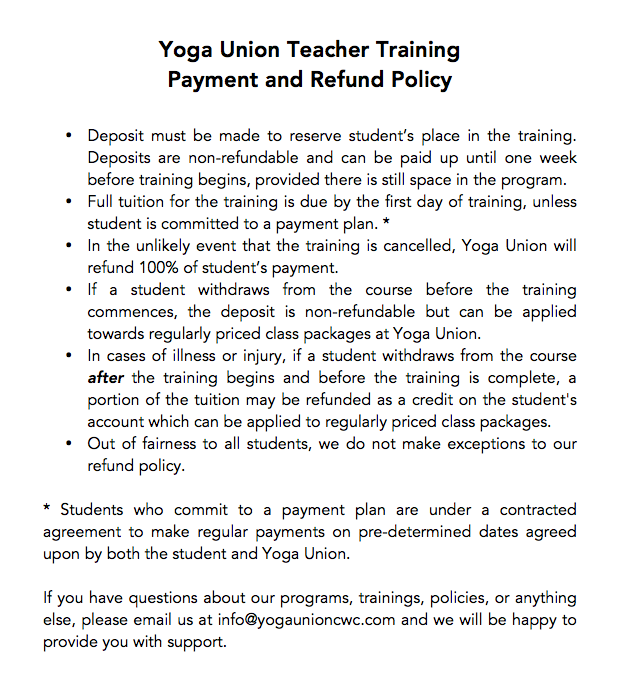 *** Please contact Anna with any correspondence regarding teacher training (booking@yogaunioncwc.com). Anna Mitra is an Oregon-native yoga teacher, a dedicated student, and a great lover and believer in movement as a form of medicine. Her yoga journey began in 2010, in a time when she struggled daily to manage her mental health. Slowly the mindful practices of yoga began to replace her unhealthy coping mechanisms and through these practices, she has developed a stronger relationship with her own healing process. It is through this lens that she has come to terms with the many aspects of her own inner darkness, and the light she has discovered within it. In 2015, she met her teacher, Annie Adamson, leading her into an apprenticeship and soul friendship that lasts to this day. Under this guidance, Anna has completed more than 500hrs of training at Yoga Union, with a special focus on the therapeutic benefits of the full-spectrum practice of yoga. She believes in the wholeness, the deep intuitive wisdom that we all have, and strives to help students remember this within themselves. She empowers her students to be curious, to move in embodied ways that they might not otherwise, to remain present with all that arises, and supports them in discovering their own unique way of being. She encourages her students to take charge of their practice, to listen deeply to the innate wisdom of their bodies, and to make intentional, compassionate choices about how they interact with themselves and in the world. Along with teaching weekly classes, Anna also is an assistant in Yoga Union’s 200hr Teacher Training and a manager at the studio. She is infinitely grateful to all of her teachers, and all of the support that she receives. We require a $400 non-refundable deposit to hold your spot. Payment plans now available. Please contact us at info@yogaunioncwc.com for more information. Once payment is received, we will provide the reading list so you can begin your self study of the texts.